start experimenting with an Enterprise-class Linux distribution without rebooting or installing anything else than the vmplayer. The Operating System and Browser are encapsulated in a disposable virtual machine. If anything goes wrong, delete and start over again; your underlying Operating System will not be modified. The archives are compressed with 7-Zip. Power Users may wish to review and adjust several parameters in the Browser-Appliance.vmx configuration file using a text editor. For security reasons, Shared Folders are disabled by default. You can download the Browser Appliance from the Download section above. From the VMware website, you can also download VMware Player, a free application that you can use to run the Browser Appliance. In the dialog box, select "Open a Virtual Machine" and, browse to the directory where you installed the Browser Appliance, select the file Browser-Appliance.vmx, and click Open, then "Play Virtual Machine". The Browser Appliance powers on automatically, and the Linux operating system, provided with the Browser Appliance, boots up. This may take several minutes. 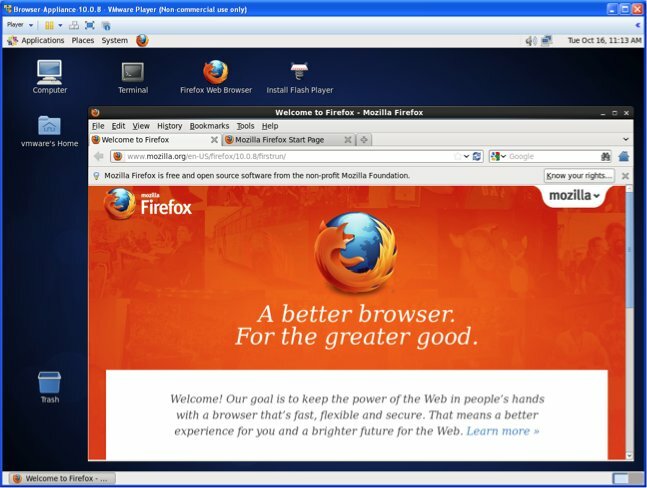 Then the Mozilla Firefox browser starts automatically. Enter a URL in the location field at the top of the browser and click Go. Double-click the "Install Flash Player" icon on the Desktop. Enter your current password (vmware by default) and new password. In a text editor, go to the folder containing your Browser Appliance files, and open the Browser Appliance configuration file: Browser-Appliance.vmx. This protects your computer from any spyware or other malware that is transferred to the Browser Appliance while you are browsing. However, setting the Browser Appliance to revert on shutdown will cause the Browser Appliance to discard changes you have made in the current session. To remove the Browser Appliance, simply delete the directory containing your Browser Appliance files. There is no uninstallation procedure to perform.